For one reason or another (usually either because I've eaten too much sugar or it's 'that time of the month') my skin sometimes just says no. I break out in angry red spots and my face just hurts. It's during these times that I need something that is going to provide me with some kind of relief before I try and scratch my face off (I'm an absolute bugger for picking spots and I really need to stop it!). Just over a week ago I had a horrible break out on my hands; I had painful red spots on my cheeks and chin which were really getting me down - they were difficult to cover with makeup and they were actually really painful but there was no sign of anything that I should squeeze (squeezing spots when there's no 'head' gets really messy, believe me) so I knew I needed something to purge whatever it was out of my skin and calm down the redness but without drying my skin out totally. 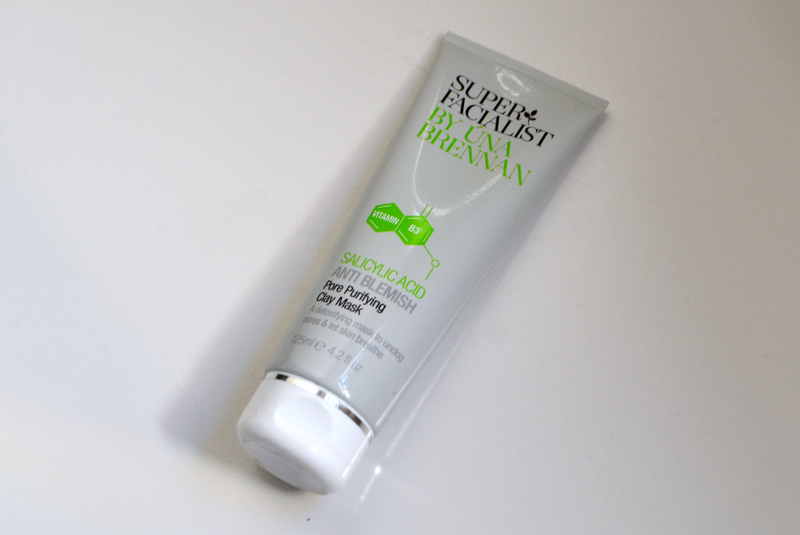 Enter Super Facialist by Una Brennan. When choosing face masks I always look for 2 key words; clay and salicylic acid. When some people see acid they run a mile thinking that you shouldn't be putting it on your face but salicylic is a good acid which can really help your skin out if you're suffering a breakout. Clay absorbs excess sebum (awful word), bacterial and various other toxins from your skin so it's perfect for helping to clear blemishes. The Anti Blemish Mask by Una Brennan has both of these and it's very affordable at £8.99 so I figured it'd be a good choice. Like most face masks you apply it to a cleansed face and leave it on for 10 minutes (packaging says 5, I prefer 10). It's quite tingly for the first couple of minutes which I like because it makes me feel like it's working; from what I gather from skin gurus like The Hirons, tingling is good, burning is not so good so I was quite happy with the feeling - it didn't concern me. Even after 10 minutes the mask never dries fully on me and I'm not quite sure why but I doubt that it actually makes a difference. After just one use my skin felt loads better; it reduced the size of the spots and hydrated my skin wonderfully. You know sometimes when you take off a face mask your face feels tight, well that doesn't happen with this, my skin just feels soft as a babies bum. I have a bit of a problem with blackheads on my nose and these have been visibly reduced with this mask which has made applying makeup much easier. I'll definitely repurchase this because I think it's really helping my skin to calm down and stay calm; my cheeks are definitely not as red as they were before and the spots that I had a week ago are nowhere to be seen, not even a bump or any dry skin so a definite thumbs up from me. It should be pretty easy to find as well because Una Brennan products are available in most larger Boots stores and obviously Boots online (I ordered mine online and got free in store collection). What's your favourite face mask for when you're skin isn't co-operating?